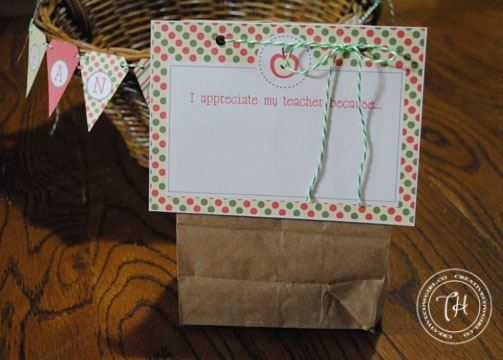 Teresa from Creative Cowgirl is sending a gift to her daughter’s teachers every day for seven days (so super-sweet)! 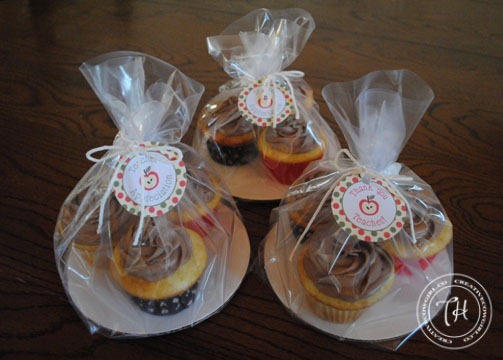 First up were plates of cupcakes, each tied with a tag. If you haven’t downloaded your printables yet, it’s not too late – get info here, at How Does She! As a teacher I would be thrilled to get these beautiful gifts. Thank you for sharing. Our Student Council gave us desk sized photo frames with decorative paper inside and a dry erase markers to write messages on them. They also wrote us sweet notes on your printable, gave us a morning soda, made tiny versions of your banner for each of our teacher workrooms AND cleaned out each refrigerator in each workroom too!! I LOVE this week!!! Thanks for the inspiration! Wow! I would like to have those lovely gifts! But in Spain this celebration is not extended... The apple design is perfect!